Just stop! Seriously. Cut it out!! Instead of trying to change one particular burger chain that has a tradition of a limited menu, why not open your own chain of restaurants that explicitly caters to Vegetarians and Vegans? 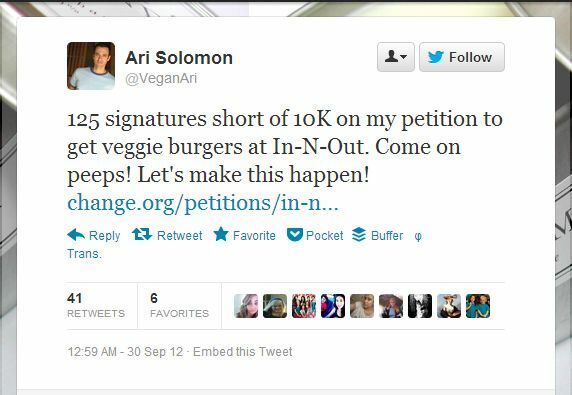 If this petition had been targeted at McDonalds or Burger King, would it have irritated me as much? Maybe not. I’m kinda surprised those fast food joints don’t already offer veggie burgers given their wide selections. I don’t even live near an In-N-Out, but having been to the west coast, I’ve experienced it. I also respect their tradition of a limited menu and their secret menu. Same with Five Guys. I respect their limited menu. I know not to go their for a chicken sandwich or a salad, and I don’t plan on starting a petition to change that. It’s really much bigger than this, tho. Whenever I’m in the grocery store and walk by the frozen food cases of Weight Watchers cakes and fudge brownies, etc., I continue to be baffled. I don’t understand why people that go on a diet keep trying to find ways around their diet. If you’ve given up sweets to try to lose weight, don’t try to concoct a low-fat chocolate substitute. Give up sweets. Man up and accept your choices. I’d like to see Vegans & Vegetarians stop trying to find new ways to eat meat. If you miss meat that much, eat some. No one is stopping you. Admit that you like meat, and do like the rest of us who don’t imagine animals being slaughtered while we’re enjoying our hamburgers. That pretty much sums up the way I feel. I don’t really enjoy talking on the phone. I’m not much for chit-chat. Talking in person is fine. Texting is fine. Email is fine. Message me via Facebook or some instant messenger, fine. But whatever you do, don’t call me. Don’t pressure me into a conversation that I’m not prepared to have. And if what you have to say lasts less than 15 seconds, don’t waste my time by pretending to be conversational when you really just needed to relay some info. I remember one time when I was in high school a friend called me. After I answered the phone, I asked my friend what she needed. She replied that she didn’t need anything. She was just calling to talk. I don’t really recall anyone in my family staying on the phone for long periods of time when I was growing up (my sister is younger than me by 7 years and my brother is 9 years younger), so I was under the impression that calling someone had to have some sort of purpose, some ultimate goal. I definitely understand that some things are too complicated or too lengthy to type out. I’ll allow that. Most of the time, tho, my conversations consist of coordinating plans, and that is better in text form as far as I’m concerned. If for no other reason, it allows me to refer back to the text if I need to refresh my memory. It also helps if I’m somewhere that is loud or where I can’t carry on a conversation at the moment (e.g., the bathroom). Fortunately, technology has come along once again and provided an alternate solution. My sister introduced me to Voxer. In this app, you can send voice messages (sorta walkie-talkie/PTT), text messages, and picture messages… all in one app! You can also add other people for a group conversation. Now, if only I could get more of my friends to use it.